July 18  While eating breakfast, we were witness again to the black birds chasing the red-tailed hawk around the campgrounds. It appeared that the squirrels sensed our leaving today because they seemed to constantly be in our presence. As a final treat, Geri placed some jam and peanut butter on the picnic table seat much to their delight. However, when the chipmunk sneaked in for a sample, the chase was on throughout our campsite and into the next. It was a sight to behold with clouds of sand flying this way and that. When the jam was finally eaten, one squirrel gave in to his curiosity and jumped upon the table to sit on my journal while I was writing - boldly looking straight at me in defiance as if demanding what was next on the menu. I couldnt help but chuckle  anyone who considers these creatures in the same category as rats would have had to face their phobia many times in this campsite! 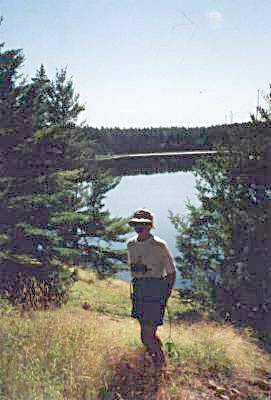 In our hiking boots and well sprayed with bug repellant, we were ready to tackle the Berm Lake Trail, a 4.5 km loop trail beginning and ending adjacent to the Achray campgrounds. Since there had been warnings that a sow-bear and her two cubs had been seen in this area earlier in the week, we decided to be cautious and carry our bear bell. 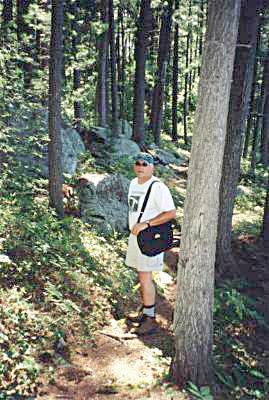 This was one time when an opportunity to view wildlife in action would not have been appreciated  long scratch marks on trees and the abundance of blueberry bushes along the trail kept us alert. The trail was well-marked and lived up to its reputation of its tall Red and White Pine trees sprinkled throughout our trek - the signs of logging in years past were evident with weather-worn stumps scattered here and there. 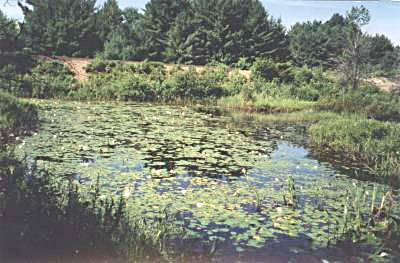 Pine Warblers and their musical trills could be heard among the pines while elsewhere among the bogs, bullfrogs were continually croaking. The scenery was just superb wherever we stopped to gaze over the lake and surrounding hillside. At one footbridge, a colourful lily-laden pond resembled a Monet painting. This hike provided everything expected in Algonquin Park, even the menacing deer flies. After a well-deserved swim and before decamping, I took my final opportunity to paddle near the campsite and to practice some canoe recoveries. We were soon on our way out of the park and towards a hearty home-cooked meal at the Irving Restaurant in Pembroke. On route home, we relived our four-day trip to Algonquin Park and agreed that we were able to partake in a majority of our planned activities  although it was brought to my attention that the canoeing expeditions out-balanced the hiking treks promised, something that will be addressed on our next outing! 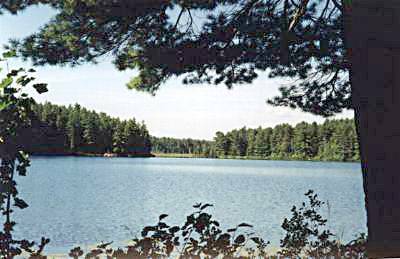 However, our bonus was the enjoyment of great workouts, fantastic opportunities to catch a glimpse of a variety of wildlife and to be able to indulge in the true beauty of Algonquin Park.